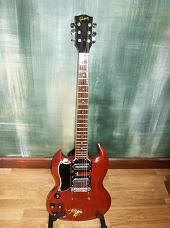 This is the original SG that was used on the majority of the original line-up albums and tours. 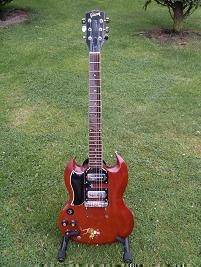 It has been identified by Gibson as a 1965 SG Special. 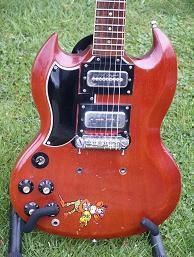 It has a Gibson P90 pick up in the bridge position that was fitted into a metal case by John Birch. The neck pick up is a John Birch custom P90 type single coil. The finger board is finished with clear polyurethane. Instantly identified by the cartoon monkey sticker, this guitar became the main instrument when the bridge pick up on Tony’s white Stratocaster failed after the band recorded ‘Wicked World’ on the ‘Black Sabbath’ album. It was not, however, without its problems. Due to the thin neck profile at the heel, there were always tuning stability problems and the single coil pick ups were always susceptible to picking up interference. The guitar was donated by Tony to the Hard Rock Café organisation (as seen in their documentary ‘Hard Rock Treasures’). At the time of writing it is on display at the Times Square location in New York City. The best sounding guitar I’ve ever heard, especially live! The song, A National Acrobat, contains growling, throaty guitar chords unlike any that come out of guitars equipped with humbuckers having massive gain. How can a P-90 become a sawtooth or a square wave generator and sound so good? Then there is the Straightener instrumental at the end of Wheels of Confusion…. Thank you! What the heck…P-90 is the best sounding pic-up. Flexible “musically” etc. But the contex must be right. The right guitar, musician etc. Look how Keith Richards change Tele many times to Les Paul Junior with P-90! P90’s are the king of all guitar tones, it’s what also underpins Leslie West (Nantucket sleighride, Tired Angels, Mississippi Queen) and Tom Scholz (More Than A Feeling, Feelin Satisfied) guitar tones. Would someone please…tell us all, where/when/why the monkey sticker happened? Did he put it there? And…why in God’s name he left something so hideously ugly and stupid on His personal guitar! I’d have cut that off with a butter knife if I’d owned it; no matter the damage! Looks to me like one of John Birch’s pickups….